They will have plenty of work to do since the 5th century Early Christian and Early Byzantine temple has been largely neglected since the 1980s when it was discovered, reports local news site Top Novini Plovdiv. The restoration and excavation of the Great Basilica of ancient Philipopolis, as Plovdiv was known after the conquest of Ancient Thrace by King Philip II of Macedon in 342 AD, is a long awaited project which will be funded with a grant of BGN 4.9 million (app. EUR 2.5 million) by the America for Bulgaria Foundation, a Bulgarian-U.S. NGO. Lead archaeologist Elena Kisyakova, who first found the Early Christian church in 1982, has made it clear that the project will focus on the restoration, conservation, and exhibition of the Great Basilica and its mosaics, and only partial excavations will be done on an “as needed” basis. 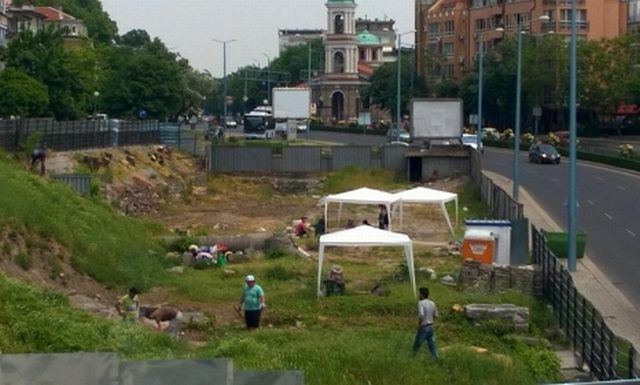 Recently, Plovdiv Municipality has moved to seek from Bulgaria’s Ministry of Culture a transfer of property rights over the entire site of the Early Christian Great Basilica. Plovdiv Municipality owns only part of the site. Back in 2002, under then Mayor Ivan Chomakov, Plovdiv Municipality sold the property to a private firm even though it contained a formally recognized monument of culture. As a result, once the scandalous deal unraveled, it took the municipality and the central government seven years of court battles to regain the ownership of the Great Basilica site. Plovdiv Municipality even had to pay the private owners BGN 500,000 (about EUR 255,000) as a compensation for a plot of 1,500 square meters. The project for Plovdiv’s Great Basilica, which is sometimes likened to similar historical monuments from ancient Constantinople and Ravenna, the last capital of the Western Roman Empire, is the second of this kind, after in 2010-2014 Bulgaria Culture Ministry, Plovdiv Municipality, and the America for Bulgaria Foundation collaborated for the excavation and restoration of another Early Christian monument, the so called Small Basilica dating back to the 5th century AD. The Small Basilica project was financed by the America for Bulgaria Foundation with a BGN 1 million (app. EUR 511,000) grant, and was formally opened for tourists in May 2014.